Pain is one of the most challenging experiences of life. Significant pain can interfere with a person's making plans and accomplishing tasks. It can also be a stress on relationships. The nature of pain and the intensity of discomfort that can be tolerated varies among people. Headaches, arthritis, back pain and other aches bother many people chronically. An injury or stress can produce acute pain in muscles and other tissues. The degree of pain and the tolerance level of the individual are factors in one's actions to counteract pain. Most people dealing with pain use synthetic chemical pain medications to block nerve signals. There is a very large market with widespread promotion of pain relief products by "Big Pharma" companies. However, these drugs have side effects that can undermine health. Natural pain relief remedies are becoming of interest to a growing number of people who want to control pain without becoming addicted to pain killer medications or destroying their health. However one chooses to manage pain, the underlying condition causing it needs to be dealt with as well. There are a variety of methods to control pain naturally. These include both topical and oral resources. Below are descriptions of effective natural pain relief products that we currently have available. Be sure to get some Relief! DMSO is a sulfur containing pain relief liniment that has been popular for many years. It is sometimes combined with aloe vera to improve its penetration through the skin and enhance the soothing benefits. MSM is a related anti-inflammatory sulfur compound that can be taken orally. CLICK HERE for more information or to order DMSO or MSM. CLICK HERE for more about arthritis pain. CLICK HERE for more about joint pain. Magnesium is a much needed mineral in which people are frequently deficient. It can be very helpful for relief of muscle pain and cramps. Some people find that taking magnesium reduces the occurrence and intensity of headaches. Magnesium supplementation is also known to improve sleep. CLICK HERE for more info or to order a well-absorbed magnesium. CLICK HERE if joint pain is the issue. Larrea ~ The amazing larrea tridentata plant contains anti-inflammatory compounds known to relieve pain. CLICK HERE for more info on larrea. 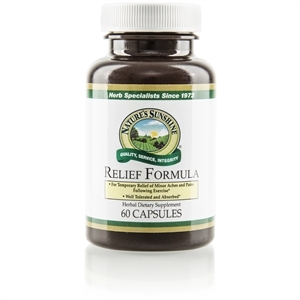 This product is designed for relief of minor aches and pains associated with physical activities and exercise. It contains a proprietary blend of herbal extracts, including a protease enzyme blend and a special hops extract. The protease blend provides excellent support for soft-tissue soreness. Proteases support a healthy inflammation response, which may promote the recovery process. The hops extract used in Relief Formula contains a high concentration of alpha acids, isolated and enriched by state-of-the-art supercritical carbon dioxide extraction technology. Alpha acids are strong antioxidants, recently linked to support the body’s natural response to inflammation and pain. Maintenance Dose: Take 2 capsules twice daily prior to meals. Best if taken on an empty stomach. Under times of body system stress, take 2–5 capsules.